Hello Katie Girl: Sail Away, Sail Away, Sail Away! Summer is just around the corner and I cannot wait! Next week is Memorial Day, which is the unofficial beginning of summer, and then in a few weeks I'll be done with school, so it will be the de facto start of my summer vacation. I am counting down the days until sweet freedom and most definitely looking forward to "sailing away" to a nice, relaxing break! This J. Crew Regatta skirt is the perfect skirt to welcome the start of summer, even if it is a little early! One of the things that I love most about this skirt is that it is reminiscent of the "good old days" of J. Crew. A lot of reviewers online have said this and I agree. It's a beautiful print and made of thick, nice quality material, which is probably why it sold out in less than a week from J. Crew's website. 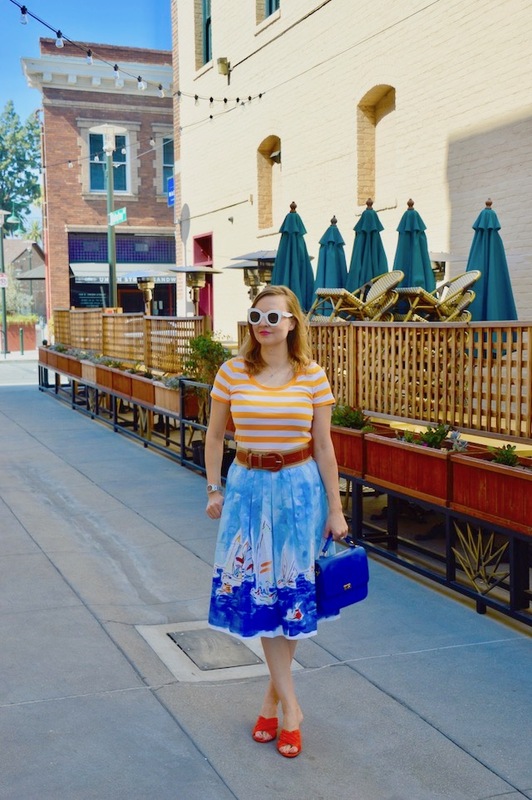 Luckily, Nordstrom still has it available, so if you are willing to pay full price for it, you too can sail into summer in this lovely skirt! I wasn't thrilled about paying full price but I thought this would be one of those skirts that would stand the test of time as a "J. Crew classic", so it was worth a little extra coin. Super cool outfit with this lovely skirt! Love these bright colors in your look! A giveaway on my blog just went live, that I think you would love! Feel free to go enter. Such a beautiful skirt, I love the painted design Katie! The colors along with your orange shoes and stripes look so bright and cheery! I love your white sunnies too. Sounds like a fun way to kick off summer! Kaite, I am so glad that you linked up with me! It allowed me to discover your blog - you put together GREAT outfits! !